Working hard in school was eventually not a waste of time after all for the University of Lagos 2014/2015 best graduating student Ayodele Dada, as he is now worth millions of naira. Dada, who emerged University of Lagos best graduating student, after attaining the perfect and highest Total cumulative grade Point of 5:00 CGPA. According to Wazobia Global Times correspondent – Ayodele Dada, after graduation begged around for money to pay his house rent before a Nigerian Radio On Air Personality Freeze of Coolfm brought the issue to his show and since then, Dada has gotten a free accommodation, connections and cash gifts from well-meaning Nigerians. The 29yrear old Dada, is now reaping the fruits of his hard labor, as so many people – business moguls, academic lovers and politicians are now pouring blessing into him. On his convocation, Dada, received nothing less than a million naira, aside numerous scholarships for furthering in his studies and job offers. Last month, he was also honored by the Federal House of Representatives , this made him to enter their plenary session – the first of its kind in Nigeria. Though, no monetary items were reported here, but our correspondent gathered that Ayodele Dada did not leave the House empty-handed. 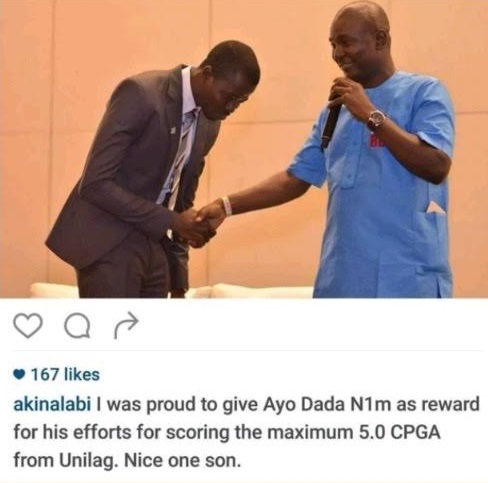 A recent blessing which entered into Dada’s house is that of the NairaBet owner, Mr. Akin Alabi, who awarded Dada a sum of one million naira, for his excellent academic performance.